« Why is radiation incompatible with life? If this tenet is correct, nuclear power (both weapon and electricity-producing) should not be allowed to exist on this earth, as they produce radionuclides as their by-products. Science has advanced since the beginning of 20th century, and led to the current atomic age. The discovery of nuclear fission reaction in 1938 led immediately to its use for a military purpose. The atomic bombs dropped on Japanese cities, Hiroshima and Nagasaki, flattened the two cities and killed several hundred thousands people instantaneously. Most of the cause of death was of non-radiation; extreme heat and the destructing shockwaves. However, many died also from the strong radiation effects, without incurring barn or physical injury. The nuclear fission reaction has since been applied to the “so-called” peaceful use, i.e., nuclear power to produce electricity. Both usages produce inevitably huge amounts of radioactive material as the byproducts. The radiation from these sources predominate now the radiation background of the earth. The radioactive materials have so far released to the surface of the earth through the atomic bomb explosions, tests of nuclear weapons, accidents of nuclear facilities including those of Chernobyl in Ukraine, Three mile island in Pennsylvania in USA, Fukushima in Japan, and some nuclear submarines, and, also from the routine release from the nuclear facilities. The Chernobyl accident in 1986 affected and killed many people, but the damaged reactor No.4 has not been fixed and has been in a sarcophagus to prevent further release of radioactive material. The sarcophagus, however, has been deteriorated after thirty years, and now is covered with another huge dome. The people affected are still suffering from many health problems thirty years later. The Fukushima nuclear power plant accident in Japan six years ago has not been fixed. It is becoming increasingly evident that it is difficult to fix it, as three reactors’ nuclear fuel rods were melted; there is no precedence for such a disaster in human history. The health effects of radioactive material released are becoming significant day by day. Un-fortunately, its reality has been covered up by the Japanese government. What’s more, the government is eagerly trying to restart the nuclear power plants as many as possible, having done so three nuclear power reactors so far, despite the fact that no electricity shortage has been experienced when no single nuclear power plant was in operation for two years (2013-2015). This implies that Japan does not need the nuclear energy. Unfortunately even the largest opposition party (Minshin) seems to be in favor of restarting them. The politicians’ concern is simply “economics”, which is seen only from the standpoint of the operating corporations. In terms of the overall economic effects, the nuclear power plants are known to be ineffective or rather disastrous. The people who are in favor of nuclear power, i.e., the present government of Japan (and others), the majority of politicians, the corporations of operating and manufacturing nuclear power plants, the bureaucrats, and many “so-called” experts depending on the nuclear industry, are concerned only with their own livelihood. They are unaware of or ignoring the fact that radiation coming from the unavoidable byproducts of the nuclear power operation is indeed incompatible with living organisms. This fact, i.e., INCOMPATIBILITY OF RADIATION WITH LIFE, seems to be recognized by the nuclear industry. Hence, the nuclear industry and its associates (termed often “nuclear mafia”) are desperately trying to cover up the evil health effects of radiation. They have tried, and have so far been able to cover them up relatively successfully. This has been possible, only because the evil effects are basically subtle, not felt by the person affected, and have so far been confined to relatively small areas and few people (compared with the vast area of the entire earth and the majority of the human race). In the following short article we would like to show why radiation is incompatible with life, and hence that the “nuclear” power reactors as well as weapons which produce radioactive material should not be on the earth. II. Why is radiation incompatible with life? Then, the basic question is: Why is radiation incompatible with life? If this tenet is correct, the nuclear power (both weapon and electricity-producing) should not be allowed to exist on this earth, as they produce radionuclides as the by-products. We will look into this issue from scientific standpoint. Let’s recognize that the earth is a rare body in the universe. A few earth-like bodies have been found, but whether life exists on those bodies is unknown. The vast majority of the bodies in the universe have no life on them anyway. Why is the earth so blessed with life? The basic reason (i) is that the majority of material (likely more than 99.99999%) is made of stable atoms. Two other reasons are: (ii) cosmic ray, harmful to life, are relatively little to reach the earth’s surface, and (iii) the prevailing temperature on the surface of this planet allows the presence of liquid water. This last issue has something to do with the currently debated “climate change”, and would not be discussed here. First, an atom is made of a nucleus and surrounding electrons. A nucleus consists of electrically neutral neutrons and positively charged protons. They are confined in a very, very small area (nucleus) by “strong” (“nuclear”) force. On the other hands, electrons are attracted by “electromagnetic” force to the nucleus, as electrons are negatively charged. All material including those constituting human bodies on this earth are made of stable atoms. It needs to be added in haste that a few unstable atoms do exist on the earth and the extent of their effects on life is quite limited, though real, but cannot be made visible unless carefully studied. When we say “stable or unstable atom”, we mean “nucleus” rather than the whole atom consisting of a nucleus and surrounding electrons. The energy state of nucleus is governed by the “strong” force (“nuclear” force). “Unstable” implies “having extra energy”, that needs to be shed. So an unstable nucleus (of an atom) undergoes a spontaneous change to a more stable state. The process is termed as “nuclear decay”, in which the extra energy is released as “radiation”. Hence such an stable nucleus is called “radioactive nucleus=radionuclide”. There are a few radiation types: alpha (α), beta (β), gamma (γ) and neutron, and others. The energies carried by these radiations are very large, as the processes of change are governed by the “strong” force. Some examples of radiation energy are as follows: 20 KeV for β from T(tritium), 1.2 MeV for β and γ combined of Cs(cesium)-137, 546 KeV for β from Sr(strontium)-90, 5.245 MeV for α from Pu(plutonium)-239. We will assume 1 MeV as a typical radiation particle energy in the argument below. On the contrary, stable nuclei remain intact forever as such without emitting radiation. Because the majority of atoms on the earth are stable, they do not emit radiation. It needs to be pointed out, though, that a few radioactive nuclides do exist on the present earth. They include uranium (U)-238, thorium (Th)-232 and potassium (K)-40. The direct effects of these radioactive nuclei on the living organisms are relatively minor, except for K-40. Hence the all the living organisms are hardly subject to the negative effects of naturally occurring radionuclides; an exception is K-40. Reason (ii) mentioned above is how radiation from the outside of the earth, i.e., cosmic ray, approaches the earth. Cosmic ray consists of electrically charged particles such as proton, α particle and electron (β), and of electrically neutral ones including γ-ray and neutrons. The magnetic field encircling the earth changes the course of the electrically charged particles. As a result, most of them would be reflected away off the earth, and would not significantly reach the surface of the earth. Neutrons and γ-ray will lose its energy as they enter the earth’s atmosphere. However, neutron causes the formation of e.g., the radioactive carbon C-14 from the atmospheric nitrogen. Ultraviolet light is also harmful to living organisms, but it is being shielded off significantly by the ozone layer in the current atmosphere. These special conditions surrounding the earth contribute to significant reduction of in-coming radiation, and helps living organisms to survive. We are thus very fortunate, but unfortunately have brought instruments to produce a lot of radioactive material in the form of nuclear weapons and nuclear power reactors. The effects of radiation on living organisms are based on their interactions with the molecules (compounds in general) in life. The physical effect of radiation is of various nature, but are summarized as “ionization”, i.e., ejection of electron from a chemical compound. In order to understand the likely magnitude of the radiation effects, we need to look at the material, i.e., chemical compounds; how they are constructed and the energy values involved in their changes, i.e., chemical reactions. The materials on the earth are all made of chemical compounds/molecules; they consist of atoms connected by chemical bonds, which are made through the electromagnetic force. For example, water molecule is made of two hydrogen (H) atoms and one oxygen (O) atom in the manner of H-O-H, where the line connecting H and O is a chemical bond, formed by placing two electrons between two atoms. The negative two electrons attract two positively charged nuclei, i.e., (+ of the nucleus of H) (– two electrons)(+of the nucleus of O). All chemical compounds are composed of atoms connected through chemical bonds. Some of typical energy values for chemical reactions are as follow: 13.6 eV for removing an electron from a hydrogen atom; 4.3 eV for breaking H-C bond in CH4(methane), 3.6 eV for breaking C-C bond in H3C-CH3 (ethane), 30.6 eV to remove an electron from Fe(2+). The chemical reaction energy ranges from 1 eV to 100 eV. Now we will try to figure out what effects a radiation particle will have on chemical materials. We assume that a typical chemical energy to eject an electron from a molecule is about 30 eV and the ejected electron may travel with 20 eV. That is, a single impact of a radiation particle on a single chemical compound would use energy of 50 eV to eject an electron. If this is so, a single radiation particle of 1 MeV will eject electrons from approximately 20 thousand molecules. This number varies with many variables (density of chemicals in the material, kind of compounds, etc), and likely ranges something like from 100 to 10,000 molecules affected. Many of the molecules with lost electrons may break in chemical bonds and be destroyed. Some of them turn into free radicals. Some ejected electrons could have high enough kinetic energy and act as β-particles. Anyway, a single radiation particle of typical energy will destroy something like 100 to 10,000 molecules. In the subsequent argument, we will assume 2,000 as a typical number of molecules destroyed. The effects mentioned in the segment above are of direct nature; i.e., “direct” effect of radiation. The “indirect” effect is due to the chemical reactions caused by some entities formed by the direct effect. The most important one is the effect of hydroxyl free radical (.OH), which forms as the breakage of H-O bond in water molecule. This free radical is extremely reactive, and removes a hydrogen atom from a molecule it encounters. The results would be another free radical formation, and likely deformation on the affected molecule. Hydroxyl free radical is one of the so-called “reactive oxygen” species (ROS), which include superoxide free radical, hydrogen peroxide, alkyl hydroperoxides, and oxygen molecule in a singlet state (1O2). The ROS’s are all more reactive than the oxygen molecule present in the atmosphere, which is in a triplet state (3O2). ROS’s can form under ordinary physiological conditions, except for hydroxyl free radical, which is formed only by high-energy radiation. 2. Why is 10 Sv (Gy) lethal? Radiation exposure dose is measured in terms of absorbed energy, Gy=J/kg. Effects on living organisms are dependent on the nature of radiation. α-Particle, being heavy (with two protons and two neutrons) and electrically charged, has stronger effects compared with β (an electron) or γ-particle. γ is an electromagnetic wave, but behaves as a particle (photon) when it interacts with atoms and molecule. Thus, equivalent exposure dose Sv (Sievert) is defined as Gy times weighing factor, which is 20 for α and 1 for β and γ. We will see now what Gy or Sv imparts. In the case of β and γ, Sv value is the same as Gy value. From the careful studies on the atomic bomb victims in Hiroshima and Nagasaki, it has been determined that exposure of 10 Sv (or Gy) or higher causes an instant death of a human. However, this energy raises the body temperature merely by 0.0024 degree, if given as heat energy. Obviously this temperature change would not even be felt by the person, let alone killing him. Yet it does kill a person instantly. How come? This question does lead to the basic reason why radiation is incompatible with life. 10 J was given by a radiation exposure to, say, the explosion of an atomic bomb. In this case, radiation comes from outside of the body; this is termed as “EXTERNAL” exposure. Suppose this radiation consists of the typical 1 MeV particles. Since 10 J=6.26 x 1019 eV, this much of energy will be supplied by 6.26 x 1013 particles of 1 MeV. 1 kg of human body typically consists of 1012 cells. Therefore, each cell will receive 60 radiation particles on average, if they distribute evenly throughout the body. Hence, 60 x 2,000=120,000 molecules in each cell will be destroyed. Likely many cells would die, or cannot be reproduced, and hence the body will die soon. It is more likely that they do not distribute evenly, and hence that the more highly exposed portions would have many more molecules destroyed. This is a simple idea. Is there any proof for it? Two observations will be mentioned.
. These observations imply that many organs inside the body were destroyed by the strong radiation. A few workers were accidentally exposed to a strong radiation due to an accidental critical condition in JCO, a company dealing with the nuclear fuels, on 1999.09.30. The person exposed to the highest dose of 17 Sv (mostly neutrons) was hospitalized immediately but died 83 days later despite utmost care given, including replacement of the bone marrow. A doctor who took care of him said: “…the double strands of DNA were all broken….he died of multi-organ failure….” . This implies that many biomolecules including DNA were broken and many organs were damaged by the radiation. “A patient claimed: ‘I am not sick from the “pika“ (the A-bomb explosion)’ ‘What makes you say that?’ ‘Well, I did not come to Hiroshima until two days after the bombing. You see one of my children did not return home…It wasn’t until after walking around the ruins for two days, I began to feel ill’…Soon after, he began to display a number of odd symptoms and passed away.” It was very likely due to inhaling the floating radioactive debris (minute particles=fallout), which irradiated the body from inside. This is termed “INTERNAL” exposure. This aspect of exposure is more serious than the external exposure at the lower dose level, but has been ignored officially. 3. Defense mechanisms against radiation? Another question would be: Can living organisms have defense mechanisms against the destructive effects of radiation? It is impossible. Chemical means can provide energy of utmost 100 eV (usually much lower) available to defend the radiation effects, which has million times as large energy. This is the basis for the tenet that radiation is incompatible with life on the earth. It needs to be mentioned that some damages done by radiation can somewhat be repaired by some mechanisms present in living organisms. Particularly it is true with DNA, the basis of life. There are several mechanisms to repair the damages on DNA. They have been evolved for repairing damages done by non-radiation effects, as DNA is constantly subject to disturbing effects, chemical and biological. The mechanisms evolved so far can repair some damages done by radiation if they are of the same nature as non-radiological ones. Radiological damages are quite random, and some of them are beyond the existing repairing capacities. No direct repairing mechanism is known for other biomolecules. However, some existing chemicals and general physiology such as immunity, can reduce or alleviate the damaging effects by radiation or the damaged situation. The free radicals formed by radiation, particularly on water molecule and oxygen molecule, can be deactivated by some chemical agents, such as glutathione, flavonoids and ascorbic acid. For example, glutathione (abbreviated as G-S-H) can react with hydroxyl radical .OH radical: 2G-S-H + 2.OH  G-S-S-G + 2H2O. Therefore, these molecules can somewhat reduce the indirect radiation effects. Most of SOR’s except hydroxyl radical occur under normal conditions without radiation, and hence some living organisms including human have evolved mechanisms to reduce their effects. Enzymes are known for hydrogen peroxide (catalase), superoxide (superoxide dismutase), and so on. Anyway, no defense has evolved against the radiation effects, and not sufficient mechanisms have been devised for repairing the damages caused by radiation. Radiation affects any chemical compounds, but its effects are most prominent on living organisms, particularly animals, as they are based on fairly fragile systems. 4. Is there safe dose? Could a sufficiently low exposure be safe? Or is there any threshold of exposure level below which no ill health effect is expected? The data obtained so far rejected the presence of threshold, and have demonstrated a linear relationship without threshold (termed “LNT” relationship) in the relationship between health risk and the exposure dose at low levels. X-ray is equivalent to γ-ray, though weaker, and is used for diagnostic purposes and others in medicine. The exposure is entirely external, and the dose can be determined accurately. Several studies have demonstrated the LNT relationship regarding the cancer risk and the X-ray exposure dose [3,4]. These data deal with low level of exposure below 100 mSv. Even the data on the atomic bomb survivors in Hiroshima and Nagasaki indicated LNT relationship for all kinds of cancer and many non-cancerous diseases . 51.3% of all the children in Ukraine who got thyroid cancers due to the Chernobyl accident received less than 100 mSv, and 16% even less than 10 mSv . However, the Japanese government still insists that there is no danger for cancer at exposure dose lower than 100 mSv. Another issue is the effect of internal exposure as against external dose. The official data regarding Hiroshima and Nagasaki  are based on the external exposure dose due to the bomb explosion. They did not take account of possible “internal” exposure. The exposure dose caused by external irradiation is defined per the body mass (Kg), as irradiation is supposed to spread throughout the body; i.e., Gy (or Sv)= energy absorbed by 1 kg of the body. When a radioactive material enters a body and irradiates the immediate vicinity of the local the radionuclides settled in, it irradiates, let’s suppose, only the area that weighs 2 g, because α or β particles do not travel long distances. Nominally D (Gy) value =D joule/kg. In reality it irradiates the area of 2 g, and hence the actual dose should be D joule/2g = D joule/0.002 kg=500D joule/kg. The actual dose values would depend on many factors, and not always 500 times of the nominal value. Anyway, the internal dose would be much higher than the nominal dose value implies. Often, an official argument is based on the nominal external dose rate, even if the actual radiation is “internal”, and therefore, it devalues the magnitude of effects. This is particularly true in the case of accidents of the nuclear facilities, where the external exposure dose is typically relatively low, and the serious effect is mostly due to the internal exposure. In this case, internal exposure dose cannot be estimated from the external dose value such as spatial dose, as radioactive material may enter through various routes, and such a chance to enter a body has little to do with the spatial dose. The chance of inhalation of minute particles floating may be somewhat related to the spatial dose rate, though. The incompatibility of radiation with life implies that the radioactive material have to be disposed and stored safely, in the way they would not affect all the living organisms on the earth. We have not yet found very effective ways to do so. The radioactivity lasts long. Pu-239, for example, last 480,000 years, which is twenty times of the half-life (24,000 years), by that time the radioactivity will diminish to about a million times smaller than the original. Even the most widely distributed cesium (Cs-137) takes about 600 years (20 times of half-life 30 years) to become almost nil. Meanwhile they keep emitting radiation, heating and damaging their surroundings. The Chernobyl’s damaged nuclear reactor has been covered by a large sarcophagus to reduce the escape of radiation the last thirty years. It has deteriorated significantly because of radiation from the debris and weather, so that another huge cover has recently been constructed and placed on top of the sarcophagus. It is said that this cover may last a hundred years, and then it will have to be replaced or covered further. This illustrates how difficult it is to store radioactive material. This is a single example. There are hundreds of sites where radioactive waste is now stored and some difficulties are experienced. It is imperative for us to find safe ways to store the radioactive waste. There may not be an absolutely safe solution on the earth. Yet, the humankind is earnestly increasing the radioactive wastes in huge quantities. This is insane. Approximately 450 nuclear power reactors are presently on this earth. In the nuclear power production of electricity, only one third of the heat produced in a reactor is converted into electricity, and the remainder two third of heat is released into the surrounding. A typical 1giga watt reactor will release 4.7 x 1016 joule of heat into the environment per year. This much heat will bring 100 million tons of water at zero degree to boiling. This is with a single nuclear reactor. The nuclear power reactors are excellent environmental heaters. Hundreds of such reactors are operating on this earth. But this fact is ignored in the argument of the nuclear power being environmentally clean. This is not the only reason for the nuclear reactors being unclean. In addition, this typical reactor of 1 giga (thousand mega) watt of capacity (electricity) produces in a year radioactive material equivalent to about 1000 Hiroshima atomic bombs. In 2015, the total amount of electricity produced by nuclear reactors was 2,441 BkWh (billion kilo watt hours: data ), which is 8.79 x 1018 joule. 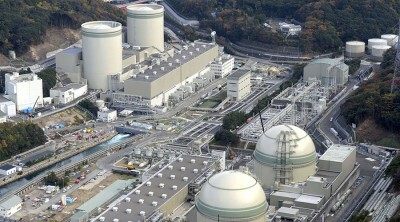 It was produced by about 280 nuclear reactors of 1 giga watt capacity. So they produced radioactive material approximately equivalent to 280,000 Hiroshima bombs. In addition, they released 1.3 x 1019 joule of heat into the environment. These are the values for just one year. Nuclear power reactors have been operating the last forty years, though not always this many. Anyway, an enormous amount of radioactive material has been made on the earth. How much of it has been released into the environment is not easy to estimate. They have come out into the environment through the tests of the nuclear weapons, use of depleted uranium bombs, the routine release of some radioactive material from the nuclear facilities under normal conditions and others, in addition to the accidents at nuclear facilities. The effects of the released radioactive material have been amply observed and reported, and yet are not shared with the majority of humankind. We mention here only a few cases, and refer them to a few major sources. The nuclear weapon explosion tests in the atmosphere affected the people in the eastern side, Utah, of the test site in Nevada (1951-1960, ref ). Chernobyl nuclear reactor accident in the present Ukraine (1986) was one of the worst nuclear facility accidents, and people are still suffering . Fukushima nuclear power plant disaster (2011) cause by the huge earthquake along with tsunami is far from settled, and health effects are only now becoming manifest . These incidents represent the notion that the nuclear power is “not clean” at all, rather it is the dirtiest. The world on the whole depends on the nuclear power by about 11% for the electricity production in 2015 . A number of countries still rely significantly on the nuclear power. Some numbers are: 76% in France, 56% in Ukraine, 56% in Slovakia, 53% in Hungary, 38% in Slovenia, 38% in Belgium, 35% in Armenia, 35% in Sweden, 34% in Finland, 34% in Switzerland, 33% in Czech, 32% in S. Korea, and 31% in Bulgaria . Fortunately no serious accidents of nuclear facilities has been experienced so far in these countries except for Ukraine (Chernobyl accident), though minor accidents are known to have taken place in many of these countries as well as others not listed here. Nuclear facilities are prone to accidents anyway. The level of dependency on the nuclear power seems to be reflected in the cancer incident rate in those nations. The cancer rates of some countries listed above are plotted against the nuclear power dependency; it is shown in the figure below . Except for France, there seems to be a correlation between them. This does not necessarily imply that radiation from the nuclear facilities alone is somehow related to the cancer. The more direct data relating the nuclear facilities and the cancer rate are illustrated by a study termed KiKK . It investigated all German nuclear reactors and found that children living within 5 km from a nuclear reactor had higher risk of cancer (particularly, leukemia), more than twice compared to those living farther away. A similar study has been conducted  with regard to leukemia among children living near nuclear facilities in other countries: UK, Canada, Japan and USA, and found the trend similar to that of KiKK. Cleaning and disposing the damaged nuclear facilities require an enormous amount of money, as well as human sacrifice (workers exposed to the radiation). Compensating the victims who lost lives and healthy ways of life and suffer from other difficulties also need a lot of money. Decommissioning an old nuclear reactor, even if not damaged, takes decades, and yet the radioactive waste cannot be disposed safely as yet, because humankind has not found a good way to do that. But, obviously, we have to find it out before too long. All these processes require money as well as energy. All told, the amount of money for disposing the nuclear facilities and bringing the sites to clean lots, and providing adequate compensation for the victims would be astronomical. It could be beyond the ability of corporations, and hence consume a lot of money earned by the citizens. Such a situation could destroy the financial basis of a nation. Upon the Fukushima disaster due to the great earthquake and tsunami in 2011, all nuclear power plants in Japan were shut down. After a while, the Japanese government restarted a single nuclear plant in 2012-13. After this reactor was shut down in order to inspect the facility, no nuclear power plant operated for almost two years until the end of August of 2015 (2013-2015). While all these things were happening, no electricity shortage was experienced in Japan, even though Japan had relied about 30% of electricity on the nuclear power before the Fukushima disaster. This fact definitely implies that Japan does not need nuclear power. Unfortunately, the current government is eager to restart the nuclear power plants, and indeed has done so with three nuclear power reactors as of Jan. 1st, 2017, despite of the strong opposition from the Japanese people. As mentioned earlier, a number of countries in Europe still depend heavily on the nuclear energy. Some of them have decided in the face of the Fukushima accident to abolish the nuclear power; Germany, Belgium, Italy and Switzerland. Recently Taiwan government announced that they would abolish their nuclear power plants by 2025. Other countries listed earlier have not made a move toward abolishment, but, hopefully, they will soon realize the danger of the nuclear facilities, and start decommissioning them. We are fortunate to have inexhaustible energy sources available on this earth. The total amount of energy humankind used in 2005 is estimated to be 4.9 x 1020 joule. The energy influx from the Sun on the entire surface of the earth is estimated to be 8.9 x 1016 joule/sec, and hence it will be 2.8 x 1024 joule per year. The solar energy alone could amply provide all the energy humankind needs. Wind power (driven ultimately by solar energy) available on the entire earth is estimated to be 2.3 x 1021 joule per year, and so, theoretically wind power alone may be sufficient. Humankind needs to technically overcome the practical problems associated with these freely available energy sources, and should resort to these energies as far as feasible, and as soon as possible. Other inexhaustible energy sources including “geothermal” and “tidal” are also to be employed as much as feasible. In other words, we could be energy-sufficient, without resorting to non-renewable carbon fossil fuels or nuclear power. nuclear power plants are not economical, but rather could bring disasters to the operating companies and even the nation’s finances. Eiichiro Ochiai: retired chemistry professor; has become seriously concerned with the radiation effects since the Fukushima nuclear power plant accident in 2011 and has published four books on the theme of “Radiation is Incompatible with Life”, including “Hiroshima to Fukushima: Biohazards of Radiation” (Springer Verlag (Heidelberg), 2013).